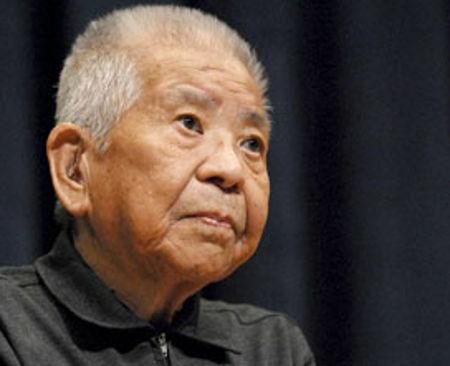 Man who survived two atomic bombs dies aged 93! He was an impassioned and articulate man, a respected teacher, beloved father and grandfather — but none of these explain the unique distinction of Tsutomu Yamaguchi (left), who has died in Nagasaki aged 93.He was the victim of a fate so callous that it almost raises a smile: he was one of a small number of people to fall victim to both atomic bombs dropped on Japan.On August 6, 1945, he was about to leave the city of Hiroshima, where he had been working, when the first bomb exploded, killing 140,000 people. Injured, he fled to his home — Nagasaki, 180 miles to the west. There, on August 9, the second bomb exploded.”I think it is a miracle,” he said on the 60th anniversary of the bombings in 2005. “But having been granted this miracle it is my responsibility to pass on the truth to the world.”In 1945, he was 29 and working for Mitsubishi Heavy Industries. His three-month secondment to a shipyard in Hiroshima was due to end on August 6, when the American B29 bomber ‘Enola Gay’ dropped a 13-kilotonne uranium atomic bomb.He and two colleagues staggered through the ruins where the dead and dying lay all around. They reached the station and boarded the train for Nagasaki. Reporting to work at the shipyard on August 9, his story of a single bomb destroying an entire city was met with incredulity.Then the second bomb landed. The next thing he remembered was waking to hear cheering at the broadcast by Emperor Hirohito announcing Japan’s surrender. Girl survived tribe’s custom of live baby burial! Dog saves 11-year-old B.C. boy from cougar attack!